The City Councilman has plans for the time after he leaves office and before he runs for county supervisor. The ballot is going to have some tax hikes. San Diego City Council races wouldn't normally be very interesting, except things are different now. 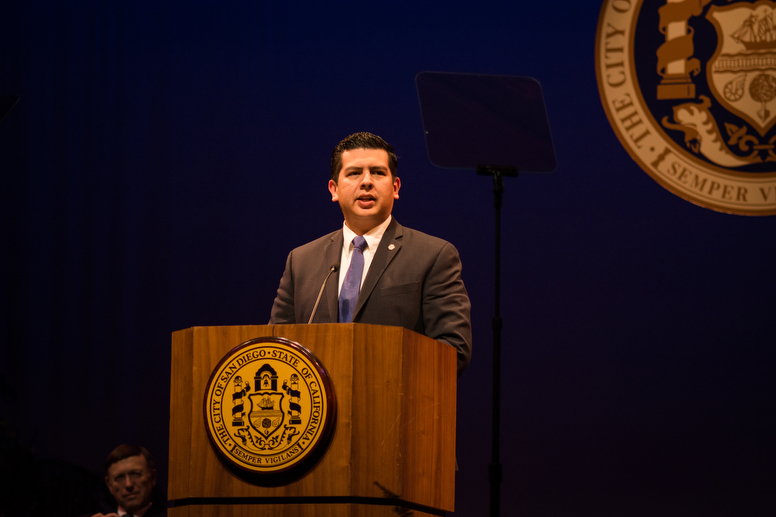 And the National City mayor cleverly angles for more time in office. We have known for a while that San Diego City Councilman David Alvarez is going to run for county supervisor – specifically the South Bay seat Supervisor Greg Cox will vacate in 2020. Supervisor jobs are coveted: The five county supervisors get paid well, earn lifetime pensions, face minimal controversy and many candidates see the county’s flush reserves as a chance to make an impact. The 2018 race to replace Ron Roberts on the Board of Supervisors has attracted big-name candidates. But Alvarez leaves his City Council seat in 2018 – two years before his race – and he wants to do something in the meantime: He’s running for a seat on the San Diego Community College District Board of Trustees. Peter Zschiesche will be leaving the seat he’s held on that board for 15 years. The endorsement of American Federation of Teachers, the union that represents educators in the community college system, is often one of the few things that matters in these races. Alvarez said he hasn’t gotten it yet. He said he’s known Zschiesche for many years and felt the incumbent had done a great job. “I think we need someone who is going to transition into the next Peter. I don’t foresee myself staying in the position as long as Peter did,” Alvarez said. He said he was still planning to run for county supervisor in 2020 and he realizes he can’t hold both positions. “Everything I have done in politics has not been something planned or expected,” Alvarez said. He said he’s been trying to meet with rivals for the job, including Sean Elo, Geysil Arroyo and Rafael Perez. Perez is an adjunct faculty member at Cuyamaca College. Elo, who is the associate director of campaigns and policy at Mid-City CAN, told me he’s just going to keep working and focusing on his own campaign. He went to community colleges before transferring to a private university and then on to law school at Cal Western. His platform is to make community college free and replace as many adjunct professors as possible with full-time professors. At this point, it would be very surprising if San Diego voters aren’t asked to approve at least one tax increase for low-income housing in 2018. It is interesting, however, that the latest trial balloon floated by affordable housing developers is for a plan to get two-thirds of the vote for a property tax increase. Most of the other plans to raise taxes in the next election cycle, whether hotel taxes for the Convention Center expansion or some kind of property transfer tax for homeless services, have been working through the assumption that perhaps a citizens’ initiative only needs a majority vote to pass. An incumbent on the San Diego City Council hasn’t lost a re-election bid since 1991. So you wouldn’t expect 2018 to be a big year for Council races, with three incumbents defending their seats. Community activist Monica Montgomery is challenging fellow a Democrat, Council President Myrtle Cole, in District 4. And Republican Council members Lorie Zapf and Chris Cate are seeking re-election in Districts 2 and 6, respectively. There will be an open seat in District 8, where Democrats will compete to succeed Alvarez. But two factors – one national and one local – are raising the possibility all the races are competitive in 2018. Democrat, boosted by strong performances in New Jersey, Virginia and Washington elections, increasingly believe there could be an anti-Republican wave across the country in 2018. Democratic challengers also have more favorable conditions in San Diego specifically thanks to the passage of Measure K in 2016. Measure K guarantees that all races go to a November run-off, even if one candidate gets over 50 percent of the vote in a primary. That means a Democrat will assuredly appear on the November ballot, where increased voter turnout improves their chances – and where a national wave would be more likely to materialize. In 2014, Zapf won re-election in June, taking 53 percent of the vote while her closest Democratic challenger won just 39 percent. Under the new rule, those two would face off again in November, when Democrats tend to do better. That alone won’t guarantee anything for Democrats – in November of that same year, Cate won his first election in a head-to-head race with Democrat Carol Kim, with 53 percent of the vote. The national trend during that cycle favored Republicans. At least three Democrats have emerged in District 2, which includes Pacific Beach, Ocean Beach, Bay Park, Point Loma and Midway. Environmentalist Bryan Pease is running, and has already collected high-profile endorsements from the likes of Assemblywoman Lorena Gonzalez Fletcher and former Councilwoman Marti Emerald. Pease previously ran for City Council in District 1, the northern Coastal District. Former Chargers employee and Pacific Beach resident Jordan Beane, physician and Bay Ho resident Jen Campbell and community activist Daniel Smiechowski are running as well. In District 6, Cate had been cruising to re-election without a challenge, until he acknowledged giving a confidential memo from the city attorney’s office on SoccerCity, a development proposal for the stadium site in Mission Valley, to the developers behind the proposal. The district attorney referred the investigation to the attorney general. Since then, two challengers have emerged. One is Tommy Hough, a radio personality who also heads the San Diego County Democrats for Environmental Action. The other is Fayaz Nawabi, a party activist and public relations officer for the San Diego chapter of the Council on American-Islamic Relations. National City voters next year could decide to limit how long a mayor can serve in the city, and thereby make it easier for the current mayor to serve for much longer. National City voters in 2004 approved a limit of three, four-year terms for the city’s mayor. Now, citizens are pushing an initiative that would impose new term limits and throw out the old ones. The new measure would limit the mayor and City Council members to just two terms. But the new measure would let Mayor Ron Morrison serve two more terms, whereas without it he’d be forced out of office when his current term ends next year, as the Union-Tribune reported last month. Two proponents of the new measure are Morrison allies, and he helped them submit the initiative. If the initiative qualifies for the ballot, the City Council for National City will decide whether to put it on the June 2018 or November 2018 ballot. If it goes forward in June, and wins voter approval, that would free Morrison to run for re-election in November. Things would get complicated if Morrison’s re-election bid was forced to share the November ballot with the measure that would allow him to run again in the first place. Councilwoman Alejandra Sotelo-Solis, a Democrat, has already announced she’s running for mayor in 2018, regardless of what happens with Morrison. But things would really open up for her if she isn’t forced to face a long-time incumbent. Democrats have a heavy registration advantage in National City: There are 10,691 registered Democrats, compared with 3,339 Republicans and 7,316 voters who declined to list a party affiliation.